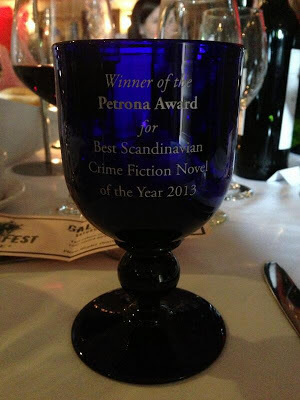 Lots of people guessed correctly and the winner of the first Petrona award for Best Scandinavian Crime Novel of the Year is Last Will by Liza Marklund, translated by Neil Smith. More photos to come but here is the "trophy". Liza also wins a ticket to CrimeFest 2014 and a guaranteed panel which it sounds like she'll be taking up! Photo courtesy of Emma Buckley. This is just good! This is the right thing to do, no doubt. Maxine Clarke did more to promote the Annika Bengtzon series than any individual could. I read these books due to her rave reviews and truth-telling about the characters. She would have loved this award going to Liza Marklund.